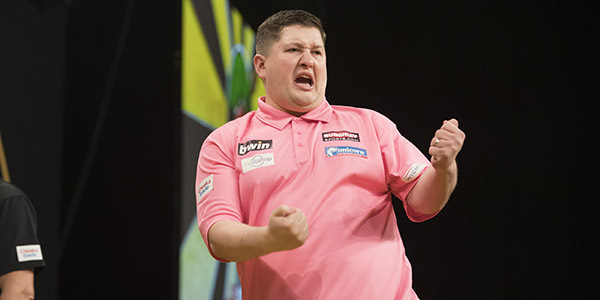 Christopher Kempf, the statistical analyst of the PDC, takes a look back at the record-breaking 2018 bwin Grand Slam of Darts group stage. Losing the first match in one's Grand Slam group does not mark the end of a player's campaign. Likewise, complacency over an initial win can often mean their downfall. Even after a player has been conclusively eliminated from their group, they still have an extra £2,000 in ranking earnings to gain from finishing third in his group rather than second. The group stage in the Grand Slam is often host to a number of remarkable performances for these reasons, but fans have witnessed an extraordinary display of thrilling matches and of records broken this year in particular. The short format of group stage matches are conducive to high averages, as a 100 average is much more difficult to sustain over 50 legs than it is over five. While White's record average in a 5-1 win over Steve Hine is a poor consolation for his double trouble and consequent elimination at the hands of Michael Unterbuchner, Brown broke his personal record twice, but lost both matches. 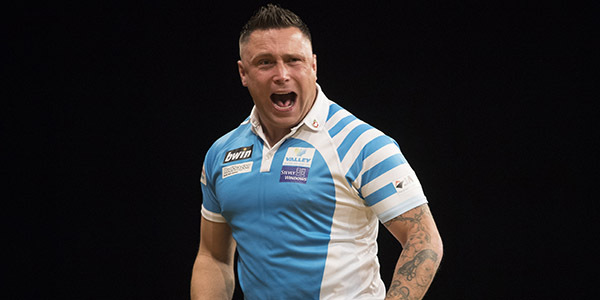 But Clayton's record average is the most impressive of the three, especially as he gave no indication of producing such a thrilling, world-class performance in his first or third matches in Group A.
Clayton has now set his overall PDC record average and TV record average in defeats of Michael van Gerwen, an achievement no other player in the PDC can claim for himself. Because the groups are selected in such a way as to prevent the best players from clashing too soon, the world number one would surely expect that an average of near 108 would comfortably trounce any opposition in the group. 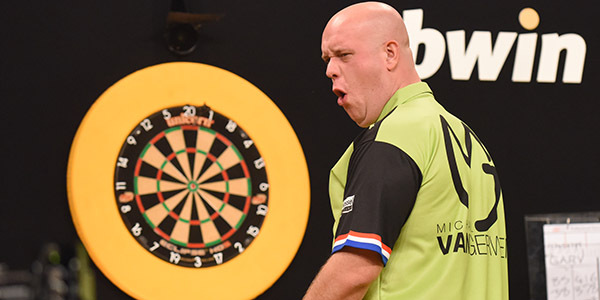 Imagine Van Gerwen's surprise when his 107.92 average was suddenly overcome by the fabulous finishing of Clayton, who completed every checkout of under 100 that he attempted, hitting 5/8 doubles to punish three missed match darts from MvG. Despite completing the first four legs in 10, 11, 12 and 13 darts, Van Gerwen could not win the fifth in 18 darts. Setting a new record for high losing average cost him the group winner's bonus of £2,500, and forced him into a tough second round match-up with Michael Smith. It is a record he will surely not want to break again. Van Gerwen is well known for having accomplished this rare feat in the 2012 Grand Slam quarterfinal, in which his two 170 finishes propelled him to a 16-12 win over Scott Waites. 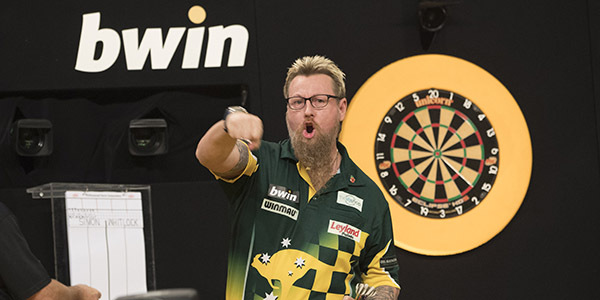 What makes Whitlock's achievement - maximum finishes in the second and eighth legs of his group match against Van Gerwen - even more impressive is that it was done in fewer than one third as many legs as MvG needed against Waites to complete his two finishes, resulted in his highest-ever average at the Grand Slam (108.86), and was integral to a comeback from 4-1 behind his Welsh opponent to win 5-4, secure a place in the knockout round and eliminate BDO World Champion Glen Durrant. Before this year, and after the completion of 528 group matches, no individual player had ever thrown more than six 180s in the group phase, and no match had ever seen more than nine. These long-standing records were broken twice in the 2018 group stage. While Price is well-known for being a prolific scorer of maximums, and Durrant has proven himself on innumerable occasions to be worthy of the title of Lakeside World Champion, the mark of 1.11 180s per leg played is still astonishing as it is three times higher than the average 180 rate seen in most PDC matches. It was even more unexpected to witness from Harms and Brown, unheralded young players with no TV titles between them. And while Price scored his seven 180s in nine legs, Gary Anderson needed only 6, a rate of 180-hitting which may not be equaled for years in a ranking match. Had he continued to score 180s at the same rate over the distance of a World Championship final, the staggering figure of 50 or even 60 180s would have resulted.